雅虎将裁员600人 - 品牌英语 - 金桥翻译论坛 - Powered by Discuz! Yahoo has confirmed that it is cutting its workforce by 4% or 600 people. The internet firm has now announced redundancies（冗陈） four times in three years, as it cuts costs to try to lift profits that trail bigger rival Google. The redundancies also follow after Google recently announced a 10% pay increase for every member of staff. In 2008 Yahoo rejected a $47.5bn (&pound;30bn) bid from Microsoft. Today its market capitalisation（市值，资本化） - the combined value of its shares - totals $21.68bn. Yahoo said in a statement: "Today's personnel changes are part of our ongoing strategy to best position Yahoo for revenue growth and margin expansion, and to support our strategy to deliver differentiated products to the marketplace." The company's revenues have risen by less than 2% so far this year, compared with growth of 23% at Google. 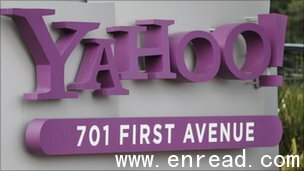 Maggie Shiels, the BBC's technology reporter in Silicon Valley, said: "The Yahoo job cuts come in stark contrast to what is happening in Silicon Valley as a whole, where companies like Google and Facebook have embarked on an aggressive hiring spree（狂欢，欢闹） . "Undoubtedly some of those employees who have been given pink slips are likely to see job offers landing in their email boxes amid a fierce battle for talent in the Valley. "As for the prospects of Yahoo's CEO Carol Bartz, these cuts are only likely to intensify pressure on her and increase criticism of her role in failing to improve the fortunes of the once mighty internet company." Yahoo had 14,100 employees at the end of September. GMT+8, 2019-4-21 03:49 AM , Processed in 0.036180 second(s), 16 queries .